NBA player Chris Kaman spoke at the State Games of Michigan’s opening ceremony at the Fifth Third Ballpark on Friday, June 26. 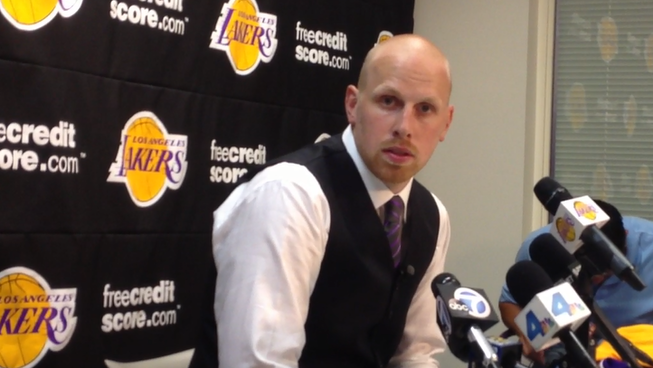 Kaman told the audience in so many words that he no longer plays to live, but he chooses to live to play instead. He doesn’t look at his career with dollar symbols anymore because that is not the focus of what he wants to accomplish. Instead, he is all about just getting the wins and helping his teammates bring home a title to their home stadium for themselves and all of their fans. Kaman emphasized the importance of passion in sports and explained that his reasoning for wanting to come back to the Portland area is because that is where he would like to eventually retire. The duel-citizen became a German officially in 2008 due to his great-grandparents being from Germany which allowed him to play on their national team during the Olympics that year. He grew up in the Michigan area and went to college at Central Michigan between the years of 2000-2003 before he was selected in the 2003 NBA Draft by the Los Angeles Clippers. He stayed with the Clippers until 2011, and then eventually bounced between other teams including the New Orleans Hornets, Dallas Mavericks, Los Angeles Lakers, and now with the Trail Blazers. Aside from basketball, some of Kaman’s other hobbies include hunting and fishing with his friends. The basketball pro spoke at this year’s State Games of Michigan during the opening ceremony that took place at the Fifth Third Ballpark last week. He made sure to convey to his listeners that at this point in his career he is just happy to be playing a game he loves for a living. If your company is interested in finding out availability and booking fees for a professional basketball player like Chris Kaman or other sports celebrities for a Keynote Speech, Product Promotion, Guest Appearance, or Basketball Camp, call us at 1-888-246-7141.